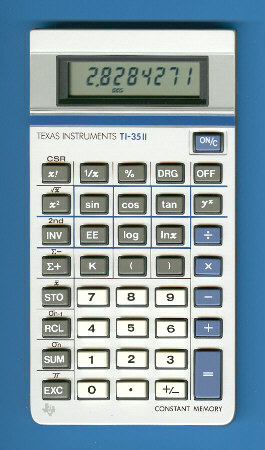 The production of the original TI-35 II was shifted in 1985 from Taiwan to Italy and USA but the overall appearance kept almost identical. Main difference between the two known TI-35 II models is the internal construction using a flexible printed circuit board (PCB) instead the rigid type. As a result we notice a slightly shifted position of the display frame and a small reduction in weight of the calculator. Up to now we discovered no differences between the products manzfactured in Italy resp USA. Even the printed circuit board (PCB) looks identical - and is known from the TI-30 III. © Joerg Woerner, July 26, 2004. No reprints without written permission.